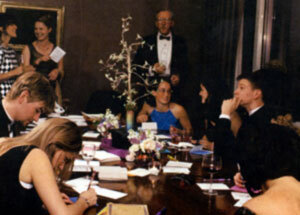 Aura readings are a great addition to parties, trade shows, meetings and conferences. Guests won't be able to resist comparing their pictures and discussing their interpretations, inspiring lively and enjoyable conversation. What is an Aura and what is an Aura reading? 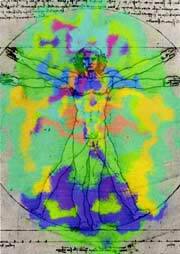 All of us are surrounded by an electromagnetic energy field. Depending upon the condition of our body, mind and spirit, the shape and colors of the field change. 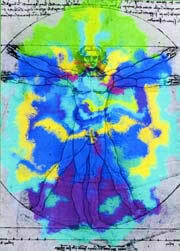 This multi-colored projection of various energy frequencies within the body is called an "aura." While some psychics are gifted enough to see and interpret auras, most human beings cannot view them with the naked eye, although sometimes we sense them. (If you've ever met someone with a charismatic "magnetic" personality, you've experienced someone's aura.) These frequencies (and their colors), however, can be recorded in "pictures" taken with a high-tech biofeedback handsensor. This imaging system analyzes how a person is using his or her energy, and the accompanying interpretation gives suggestions about how that energy might be better utilized to their benefit. 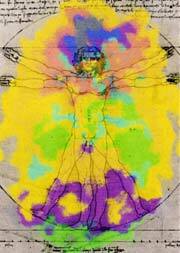 The colors of an aura are projected from seven energy centers in the body, also called "chakras." 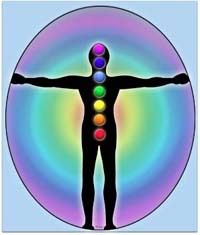 They start at the base of the spine, vibrating red, then move upward to orange, yellow, green, blue, and indigo chakras. The highest chakra is violet/white and is at the crown of the head. (see picture) Each function of each chakra is explained the aura reading.